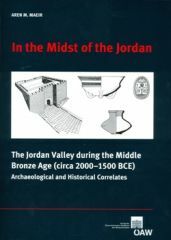 This volume is a study of the archaeology and history of the Jordan Valley of the Southern Levant (from Dan in the north till the Dead Sea in the south) during the Middle Bronze Age (ca. 2000–1500 B.C.E). The study attempts to summarize a large body of relevant materials bringing together a variety of types of finds and approaches, to form a coherent picture on the role, and significance of this region during this period. Starting from a general regional overview (including an in-depth geographical, ecological and environmental summary), a critical review of the finds from the various sites in the region are presented, followed by a discussion of various aspects of the material culture (including a detailed discussion of the pottery of region throughout the various phases of this period), the historical sources, trade and chronology, and an attempt to synthesize the settlement pattern and processes, from the beginning of the Middle Bronze Age until the onset of the Late Bronze Age. While including traditional aspects of analysis such as comparative stratigraphy, pottery typology, and the discussion of the historical sources, this study also attempts to incorporate a wide range of other perspectives, including extensive pottery provenience studies (Neutron Activation Analysis), the study of settlement ecology and population dynamics, and attempts to classify the production patterns, and political and economic structures in these and adjacent regions during this time frame. In addition to dealing specifically with the finds from within the Jordan Valley, the ramifications of these finds on other regions (and issues) in the Middle Bronze Age, and vice-a-versa, influences of other regions and sites on the Jordan Valley. Thus, general questions such as the underlying mechanisms behind the beginning, development and end of the Middle Bronze Age are discusses, as well as controversial topics such as the chronology of the period and the role of the city of Hazor. The volume concludes with an appendix with a detailed list on all MB sites in the Jordan Valley, and a list and discussion of all 14C dates from the Jordan Valley (by Ezra Marcus). The volume should be of interest to scholars dealing the Bronze and Iron Ages of the Eastern Mediterranean, as those connected to the study of material culture, production, pottery provenience, chronology, trade, settlement patterns and cultural interactions, both in the ancient near east but in archaeology and ancient history in general as well.